One of the finest counter culture Los Angeles, California rock groups, Steppenwolf have guaranteed their iconic status thanks to coining the term ‘heavy metal thunder’ in their trademark song ‘Born to Be Wild.’ This epic biker anthem is closely matched by Steppenwolf’s version of Hoyt Axton’s ‘The Pusher’. Both songs were featured in the legendary hippy road movie Easy Rider (1969) (starring Jack Nicholson, Peter Fonda and Dennis Hopper) and were also featured on the soundtrack, this guaranteeing a kind of instant fame even before most people had caught up with their debut album. For the next five years, Steppenwolf cemented their reputation as a great if somewhat anomalous West Coast group. Definitely bluesy, but with the added advantage of a highly eccentric singer in John Kay, they didn’t truly fit into the time or their environment, but stood outside looking in with a sardonic smile and a leather clad insouciance that has more in common with East Coasters like the MC5 and the Blue Oyster Cult than the hippy dippy era. Flower power they weren’t. Even so they enjoyed tremendous success. ‘Magic Carpet Ride’ was another huge single hit, their albums were critically acclaimed and commercially successful – they had eight gold discs and sold over 25 million - ensuring that their first five recordings all made the top 20. Formed around the nucleus of their original group The Sparrows, Steppenwolf took their name from the novel of that name written by Herman Hesse; the German author being very much in vogue with the West Coast intelligentsia by this time. This idea, it seems like a stroke of genius in hindsight, came at producer/mentor Gabriel Mekler’s suggestion. With drummer Jerry Edmonton’s brother Dennis functioning as their confidante and an old pal from Sparrows days, they set about creating their debut. Now, Dennis was himself a fine guitar player and songwriter and he brought in ‘Born to Be Wild’, having seen the phrase used on a Sunset Strip billboard advertising a brand of motorcycle bursting through the image. Thus the outlaw metal rock star was born. The Steppenwolf album (later renamed Born To Be Wild) had many other merits. Kay’s confident vocals aside, there was also the splendid keyboards man Goldie McJohn, Rushton Moreve’s jazzy bass lines and the fluid acid guitar work of Michael Monarch, all locked against the lead singer’s rhythm and harmonica. Ensuing albums, The Second and At Your Birthday Party (with a collage painting by the great pop artist Rick Griffin) saw the band mixing psychedelia with hard rock. This latter album will spawn the hit singles ‘It’s Never Too Late’, ‘Jupiter’s Child’ and ‘Rock Me’ (featured in the film Candy). By now, Steppenwolf were heading for the kind of arena success one associates with The Doors and Creedence Clearwater Revival. Monster and Steppenwolf Live completed a phase of tremendously fruitful activity while Steppenwolf 7 (confusingly their sixth album) is considered to be one of the great-undiscovered albums of the era. 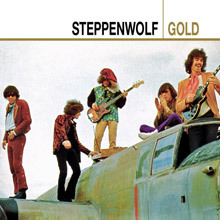 During this time, Steppenwolf also appeared at notable festivals, including Miami Pop (with The Stones, Sly and the Family Stone and The Byrds), Northridge, California with Jimi Hendrix, The Bath Festival with Led Zeppelin and at Shea Stadium where they headlined over Paul Simon, Janis Joplin and Johnny Winter. In keeping with a group of this magnitude we can offer a plethora of excellent compilations. Gold: Their Great Hits is a perfect introduction to the band, showcasing Mekler’s magnificent production and the sheer variety of their output, a musical form that stretches from avant garde pieces like 'Screaming Night Hog’ to the shimmering rock pop style that ‘Magic Carpet Ride’ exemplifies, It’s impossible to argue with this set and it is a definitive primer. 16 Greatest Hits is equally terrific, with extended liner notes and fine psychedelic artwork. Our classic format, The Universal Masters Collection – The Millennium Collection: The Best of Steppenwolf is a digitally re-mastered set that went gold in its own right. If there is a poignancy about such nostalgic fondness, it lies in the fact that we don’t see or hear nearly enough of this remarkable outfit. John Kay still takes a version of Steppenwolf on the road for a limited number of shows and he retains enormous popularity in Europe, especially in Germany where he was brought up. 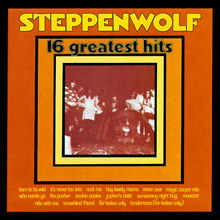 In the chaotic world of rock 'n' roll, in which the lifespan of most bands can be measured in terms of a few years or a few months, John Kay and Steppenwolf emerged as one of rock's most enduring and respected bands, delivering hard-hitting, personally-charged music for more than three decades. In the late 1960s, Steppenwolf embodied that era's social, political and philosophical restlessness, building an impressive body of edgy, uncompromising rock 'n' roll that retains its emotional resonance more than forty years decades after the band's formation. Steppenwolf standards "Born to Be Wild," "Magic Carpet Ride," "Rock Me" and "Monster" stand amongst Rock's most indelible anthems. Check them out: you won’t be let down. 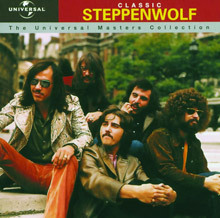 Steppenwolf is the first studio album by Steppenwolf, released in January 1968 on ABC Dunhill Records. The album was a successful debut for the band, featuring the songs "Born to Be Wild", as well as "The Pusher", both of which were used in the 1969 movie Easy Rider. "Berry Rides Again" is a tribute to guitarist Chuck Berry. The spelling of track #4 on the vinyl is "Hootchie Kootchie Man". The album credits say it was recorded at American Recording Company in Studio City, California; however, the actual name of the studio was American Recorders. 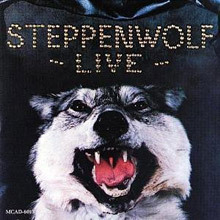 Steppenwolf Live is primarily a collection of recordings from a single concert early in 1970 at the Santa Monica Civic Center by Steppenwolf staged in support of their 1969 album Monster. 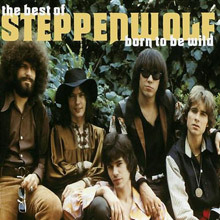 Released in April, 1970 by Dunhill Records, it contains Steppenwolf's well-known hits: "Born to Be Wild", "Magic Carpet Ride" and "The Pusher", as well as most of the songs from Monster, including the top 40 hit live version of "Monster". Highly recommended greatest hits compilation. Greatest hits compilation featuring all of the bands best known tracks.